You can get both ONI reports on piracy at Office of Naval Intelligence. Some sources, e.g. Shiptalk have reported speculation the odd man out was a Greek security guard. It is noteworthy that the "citadel" was breached. Not sure if this means the pirates were better prepared to breach the citadel on this visit, or if the citadel itself was not well designed or . . . your speculation is as good as mine. Using the future weather as a tool for piracy likelihood, ONI show two maps, the first being a large view of the Indian Ocean. 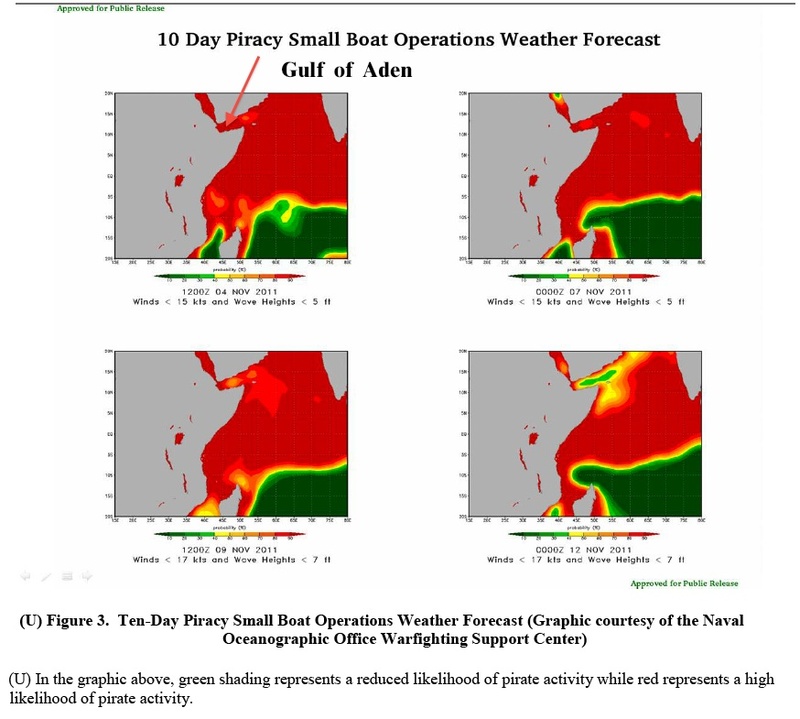 As color increases to red, weather favorable for small boat piracy increases. And, as noted on this map, don't attempt to use this for navigation, it's an informational chart. This is followed by a "close up" of key areas. I took the liberty of adding a red arrow and the test "Gulf of Aden" for those unable to spot this on their own. All of which is to say, it's dangerous out there for the under-prepared. 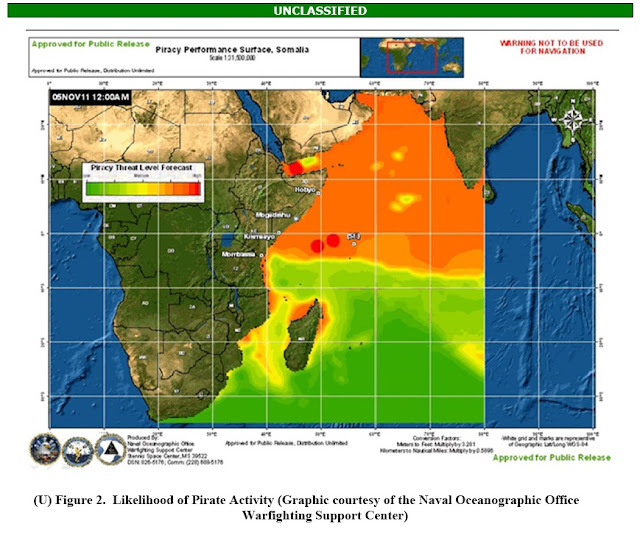 I wonder how much of an impact a det of P-8s or P-3s operating out of Diego Garcia would have, as far as providing tracking services for possible pirate vessels departing the African coast? The actual coast is a bit far for any useful loiter time, but it would take a bite out of their hunting grounds when coupled with surface interceptors. One aspect of the loss of the S-3 from the carrier air wings that tends to go unmentioned was their role in intercept, inspect and photograph missions for surface vessels. We really don't have anything to cover this area from the CVBG anymore, beyond rotary wing range. Since we appear to have drone bases in Kenya to deal with the Al Shabbab group, it shouldn't take too much of a stretch to provide a surveillence asset such as the new maritime drones, P3/E2 or the blimps that appear to be coming on line, to cover the shore and littorals before handoff to planes out of Deigo Garcia. Given modern C4I, one ought to be able to keep tabs on potential pirate vessels and mother ships and position surface assets accordingly.